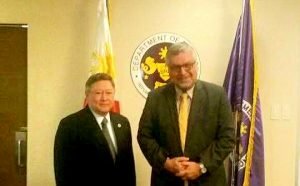 Israeli Ambassador to the Philippines, Ephraim Ben Matityau, and Finance Secretary Carlos Dominguez III met recently to discuss the two countries’ investment plans and opportunities. Among the topics they touched on was the expansion of the scholarship program for the benefit of the agriculture sector. The Philippines will continue to send annually 500 college students to Tel Aviv, Israel under the latter’s expanded agricultural scholarship program with the Commission on Higher Education (CHEd). The move is on top of other bilateral agreements the two countries forged recently to help develop particular sectors and guide Filipinos into becoming “leaders of change”. The new batch of students in the program will come from 29 agriculture schools outside Metro Manila and will fly to Tel Aviv to learn more about agro-technology advancements and techniques. The months-long program will give individuals an opportunity to work in modern Israel farms and participate in such activities as mushroom cultivation, pollination, and operations in their citrus, dairy and poultry industries. Farming experts will train them to use some of Israel’s technological innovations, such as drip irrigation, which made its agriculture sector a profitable one despite the inadequate water supply. The exchange program stemmed from Israel’s focus on supporting the development of the country’s agriculture sector. The two nations’ technical cooperation in the industry began in 1964. Ambassador Matityau and Secretary Dominguez’s discourse included the possibility of Israeli companies investing in the local BPO and IT sectors. These two industries are boosting the country’s economy despite global uncertainties brought by the rising protectionism in the US and the UK’s exit from the European Union. The Bangko Sentral ng Pilipinas (BSP), the Philippines’ central bank, shares that confidence in the country’s domestic economy, on top of its stable macroeconomic fundamentals and growth potential, buoys the continuous influx of foreign investors to the country. Apart from this, the two nations have also forged other bilateral agreements, including a Memorandum of Understanding on Scientific and Technological Cooperation, an Agreement on Mutual Assistance in Customs Matters, and a cooperation agreement on Telecommunications.